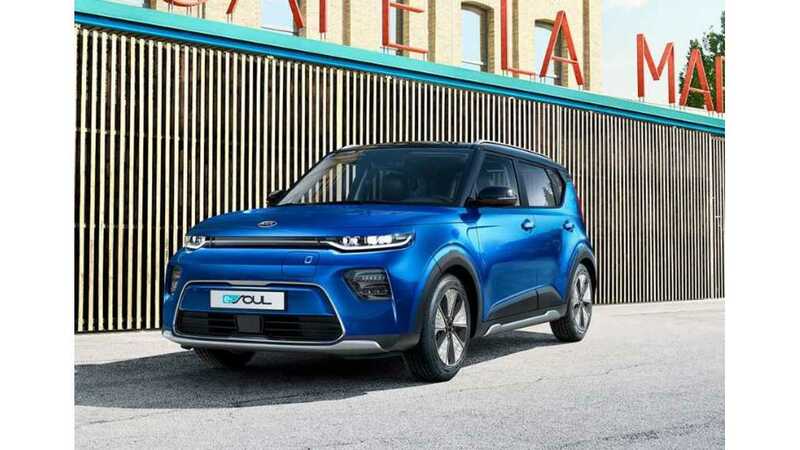 The next-generation Kia Soul EV, under the new name of Kia e-Soul, is coming to Europe where sales will begin by the end of the fourth quarter. Pricing will be announced later. In Europe, Soul will be offered exclusively in the all-electric version. Production of the e-Soul takes place at Kia’s Gwangju manufacturing facility in Korea. "In its third generation, Kia’s pioneering urban crossover has become more distinctive, dynamic and innovative than ever. While the e-Soul embraces the iconic design and playful character of its predecessors, it will be powered in Europe exclusively by electric energy, with a choice of two long-range, zero-emissions powertrains." The Long-range version will be able to go 452 km (280 miles) according to WLTP test cycle, compared to an EPA rating of 243 miles (391 km) in the U.S. The Standard version will go 277 km (172 miles) WLTP. Kia boasts that the new battery cells have 25% higher energy density (250 Wh/kg vs 200 Wh/kg), while the new powertrain is 30% more efficient than "Europe’s current best-selling electric car" - the Nissan LEAF we guess. The new electric Soul breaks with CHAdeMO and is equipped with CCS charging inlet for DC fast charging (up to 100 kW) and AC charging (single-phase 7.2 kW). The 20-80% fast recharge should take about 42 minutes. Both versions will be covered in Europe by a 7-Year, 150,000 km warranty. 26 February 2019 – The new Kia e-Soul brings long-range, zero-emissions power to the urban crossover class. The third globally-sold electric vehicle from Kia Motors makes its European debut at the 2019 Geneva International Motor Show next month. In its third generation, Kia’s pioneering urban crossover has become more distinctive, dynamic and innovative than ever. While the e-Soul embraces the iconic design and playful character of its predecessors, it will be powered in Europe exclusively by electric energy, with a choice of two long-range, zero-emissions powertrains. The new-generation battery packs powering the new e-Soul are up to 30% more energy efficient than Europe’s current best-selling electric vehicle. The e-Soul retains the strengths that have characterised earlier generations of the model, offering outstanding value for money, a roomy interior for five occupants, and high levels of space and versatility. Like all Kia models, the new e-Soul will be sold as standard in Europe with Kia’s quality promise: an unrivalled 7-Year, 150,000-kilometre warranty, which also covers the car’s electric motor and battery pack. The new e-Soul goes on-sale across Europe towards the end of the first quarter of 2019. At the rear, the ‘island’ of bodywork in the tailgate remains. Surrounded by gloss black, this panel takes on a more rounded, modern shape for the new model, and sits atop restyled rear bumpers. It is parenthesised by bold new wraparound LED combination lamps. The car is also available with a wireless phone charger at the base of the dashboard, heated and ventilated front seats, and a premium Harman Kardon sound system. An available Head-Up Display system unobtrusively projects relevant driving information on to the windscreen – such as turn-by-turn navigation directions and vehicle speed information. Drivers have a choice of long-range (64 kWh) and standard-range (39.2 kWh) powertrains. Whichever version a buyer chooses, both variants offer vastly improved range over the outgoing Soul EV. On-road performance is also enhanced, with significantly more powerful electric motors providing 395 Nm of torque – 39% more than before. The long-range 64 kWh battery pack is paired with a 150 kW (204 ps) electric motor, enabling the e-Soul to travel up to 452 kilometres (280 miles) on a single charge (on the WLTP combined cycle). Energy consumption for the 64 kWh battery pack is just 157 Wh / km on the WLTP combined cycle – 24% more efficient than Europe’s current best-selling electric vehicle. Energy consumption for the long-range e-Soul is as low as 109 Wh / km in urban environments (WLTP urban cycle). With the powertrain’s maximum 395 Nm torque available from a standstill, and 84% more power than the car it replaces, the long-range 64 kWh e-Soul will accelerate from 0-to-100 kph in just 7.6 seconds. The standard-range 39.2 kWh battery pack powers an efficient 100 kW (136 ps) electric motor. With peak torque of 395 Nm, and 23% more power than the outgoing Soul EV, the significantly improved efficiency of the battery nevertheless enables the standard-range e-Soul to travel up to 277 kilometres (172 miles) on a single charge. Energy efficiency is rated at 145 Wh / km (WLTP combined), 30% more efficient than the best-selling electric car in Europe – making it one of the most energy-efficient electric vehicles in the world. The e-Soul is also equipped as standard with Kia’s innovative regenerative braking system, operated by paddle shifters behind the steering wheel. The system provides drivers with the ability to slow the car and recuperate kinetic energy to maximise its driving range and efficiency. Drivers can choose from five regenerative braking levels (none, 1 to 3, or ‘single pedal’ mode), depending on the level of energy recuperation they desire from the brakes. The system’s ‘single pedal’ driving mode also allows the car to harvest the maximum amount of energy from its brakes, and even enables the driver to bring the car to a gentle halt without necessarily needing to push the brake pedal. The regenerative braking system can also automatically adjust the braking level if it detects the car in front slowing down, creating smoother coast-down driving – especially on a steep downhill road. A Smart Eco Pedal Guide display on the driver’s instrument cluster also keeps the driver aware of real-time battery usage based on accelerator pedal input. The new e-Soul is the first generation of the Soul to feature fully-independent multi-link rear suspension. This replaces the torsion beam rear axle on first- and second-generation models, making the car at once more engaging, responsive and comfortable to drive. Available technologies include Forward Collision-avoidance Assist (FCA), Blind-spot Collision Warning (BCW) and Blind-spot Collision-avoid Assist-Rear (BCA-R), Smart Cruise Control (SCC) with Stop & Go, and Lane Keeping Assist (LKA), Driver Attention Warning (DAW) and High Beam Assist (HBA). Kia’s ‘level two autonomy’ technology, Lane Follow Assist (LFA), controls acceleration, braking and steering depending on the vehicles in front. Between speeds of 0 and 130 kph, LFA uses camera and radar sensors to maintain a safe distance from the car in front, while monitoring road markings to keep the e-Soul in the centre of the lane. In addition, the e-Soul features a Rear View Monitor (RVM) with Parking Assist guidance and Rear Cross-traffic Collision-avoidance Assist (RCCA). As for passive safety features, the e-Soul is fitted with up to seven airbags (dual front airbags, dual front seat-mounted side airbags, side curtain airbags with rollover sensor, and driver’s side knee airbag), as well as a suite of electronic vehicle safety systems. These include Kia’s Vehicle Stability Management system as standard, incorporating traction control and electronic stability control. The new e-Soul is produced at Kia’s Gwangju manufacturing facility in Korea. It goes on-sale in selected European markets from the end of Q1 2019, with pricing announced closer to the start of sales. Five-door, five-seater all-electric urban crossover, with high-strength steel and aluminium unitary construction bodyshell. An electric motor drives the front wheels via a single-speed reduction gear set, powered by a lithium-ion polymer battery pack.